V-Power can be used in multiple ways. The V-Power system description already shows a great strategy how boost the performance a lot. Here you can find an additional great strategy to further increase the profitability of the system. 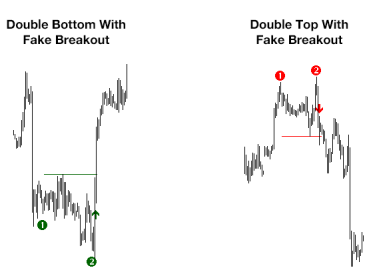 Here you will learn how to trade the best Double Tops and Bottoms. The emphasis of all trading methods is to give only highest quality trading setups. The edge of your trading should be a big as possible to reduce pain (drawdowns, losing streaks etc.) during your trading as much as possible. To achieve this, all trading methods rely on an edge of the bigger picture combined with the edge of the Double Top/Bottom Indicator. Both edges combined will give you a really big edge! 2. The edge of the system "Strong Trends + Magic Entries"
3. An additional edge by trading only the FIRST entries of the system "Strong Trends + Magic Entries"